What Problem are Robo-Advisors Solving? Historically the problem with trying to get an RIA was many have minimum investable assets of $500,000 or larger. This requirement puts many RIAs out of reach for younger millennials, or mass affluent individuals. So these individuals had to fend for themselves or take generic advise from different sources. In addition, it’s not uncommon for RIAs to charge 1-2% annually. That’s 1-2% you have to do better than the market every year just to keep up. As history has shown, fees are the worst way to reduce returns. The issue for many individuals is they aren’t cut out to manage their investments or retirement accounts. 401(k) plans and IRA accounts puts individuals in the investment driver’s seat. Many of which do not have the time to read up on investment analysis. Worst yet, may have poor investing psychology and jump out of the market at the absolute worst times (buy high and sell low). Robo-advisors, algorithmic portfolio management, today offers a brand new option in wealth management. Rather than focusing on data analysis by humans, the objective is to have tools that perform analysis and make decisions autonomously. This is the “Gamification” of investing. Schwab, Vanguard, et. al following with their own Robo-Advisor offerings. BlackRock. the asset management giant, is acquiring robo-advisor, FutureAdvisor. Many Robo-Advisors that had only proposed B2C services, are now offering their digital expertise to traditional advisors so that they can enhance their end client services. For example, Fidelity Instituational Wealth Services (IWS) teamed-up with Betterment to provide Betterment Institutional services to their 3,000 Registered Investment Advisors (RIA) firms. Financial institutions can either offer these clients a digital advice offering or they can use the offering to complement a broker. 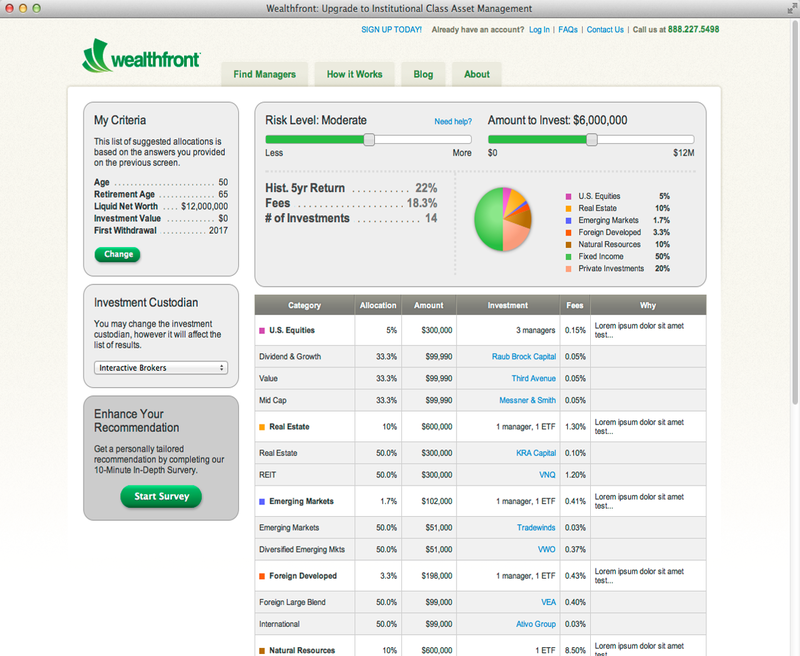 WealthFront, a robo-advisor, now claims $2.6 bln in assets under management (AUM). Here is an example from WealthFront. This architecture is similar to other Robo-Advisors with some variations. 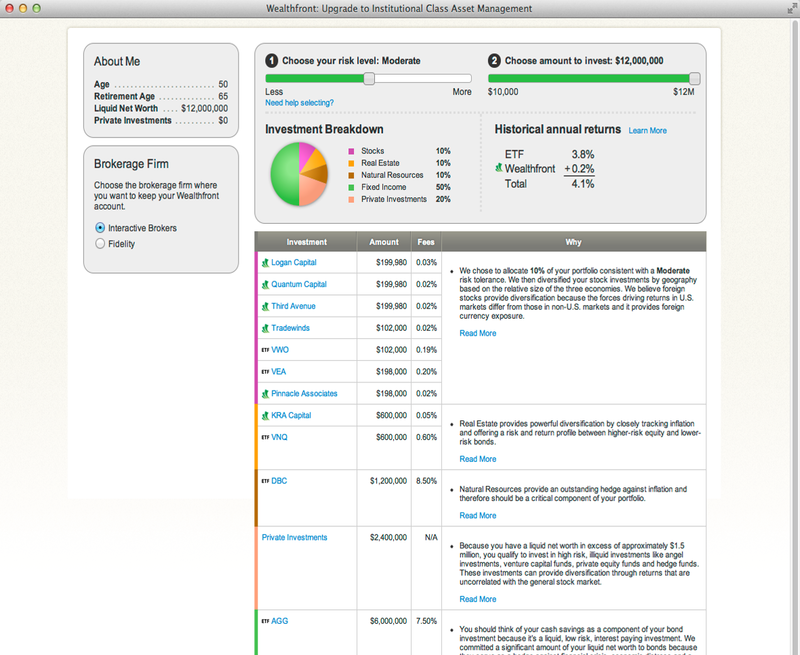 Wealthfront loads data from online systems every hour. They store all data in Avro files. They use Avro because it integrates with Hadoop, and Avro schemas add type safety to data. Wealthfront uses Hadoop for offline batch processing, via Cascading. They prefer Cascading to raw Hadoop, because Cascading provides a library of common data operations, like join, group by, and filter, on top of Hadoop’s basic map-reduce capability. 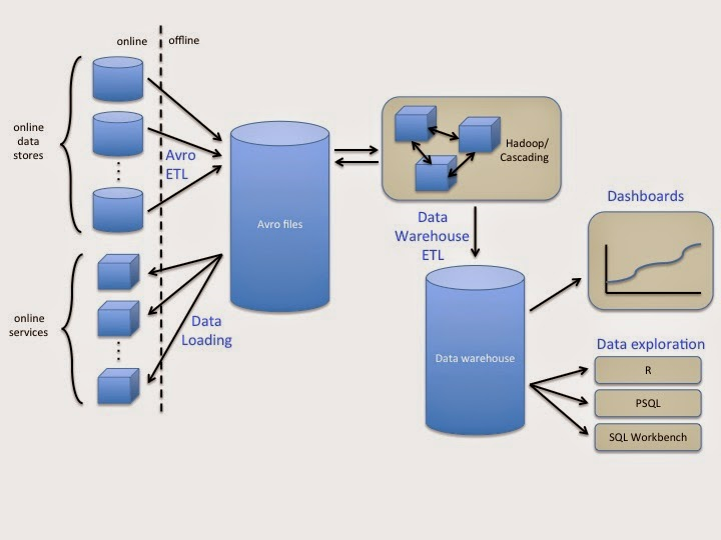 They use Cascading to load data from Avro files into data warehouse. They run all ad-hoc queries against the data warehouse. Additionally, they support views in data warehouse. When needed, they migrate view computations to Cascading to enhance query performance. They also export data from data warehouse into dashboards, and do statistical evaluation of query results in R.
Since 2009, more than 200 FinTech companies have jumped into the fledgling business of helping investors plan their portfolios online, from startups like WealthFront to fund giants Fidelity and Vanguard to brokerage firms such as Charles Schwab. These Robo Advisers services share a common approach: using automation and models to select investments that meet clients’ temperament and goals. They also share a focus on low or even no fees, which has higher-priced brokers and registered advisers worried about their profit margins. Below is a table that compares the different service offerings. The first step of segment or risk profile based investing is to fill out an online questionnaire to gauge users’ risk tolerance. Here’s a sampling of their questions. Robo-advisors, then, recommend portfolios of low-cost exchange-traded funds based on online questionnaires that investors fill out. They tend to charge annual management fees ranging from 0.25% to 0.75% of assets plus fund expenses—compared with the 1% plus fund expenses traditional advisers often charge. The idea is that investors will fare better with low fees and broadly diversified portfolios. The firms use algorithms to place investors into various portfolios based on risk tolerance. But each has its own particular bias. Consider the differences between the two startups that have garnered the most attention: San Francisco-based Wealthfront and New York-based Betterment. Wealthfront puts from 5% to 28% of its portfolios into emerging-market stocks, which tend to be more volatile. Betterment puts a greater emphasis on stocks of smaller U.S. companies and those that are believed to be trading at a discount. That can add up to big differences. An investor with a moderate bent at Wealthfront, for example, would end up with 35% of his portfolio in U.S. large-company stocks and 14% in emerging-market stocks. A moderate investor at Betterment would end up with a smaller share of U.S. large-company stocks but more in U.S. small-company stocks—and only 6% in emerging-market stocks. Robo-advisors is a very interesting use case of analytics at work. The traditional Do-It-Self (DIY) and Registered Investment Advisors (RIA) market segment is going to face increased competition from Robo-Advisors, algorithmic portfolio management, companies. In the next five years, more than $2 trillion in wealth is expected to transfer between generations. The millennials who are increasingly social, mobile, connected are seeking significantly more digital tools for managing wealth. We are replacing human beings with the right technology tools….similar to other industries with intermediaries like travel agents, reservation clerks, etc. Assets managed by Internet-age advisers are a tiny but fast-growing piece of the $18 trillion wealth-management market, which encompasses everything from the newest online advisers to old-school brokerage firms. Digital wealth-management assets, which include those managed by robo advisers as well as traditional firms with online offerings, are projected to reach $55 billion to $60 billion in 2015, up from $16 billion at the end of 2014. As market volatility intensifies more and more people are moving to robo-advisors. FinTech – digital ways of delivering financial services offering a faster, more convenient and more useful experience to customers by combining platforms, channels and technology. 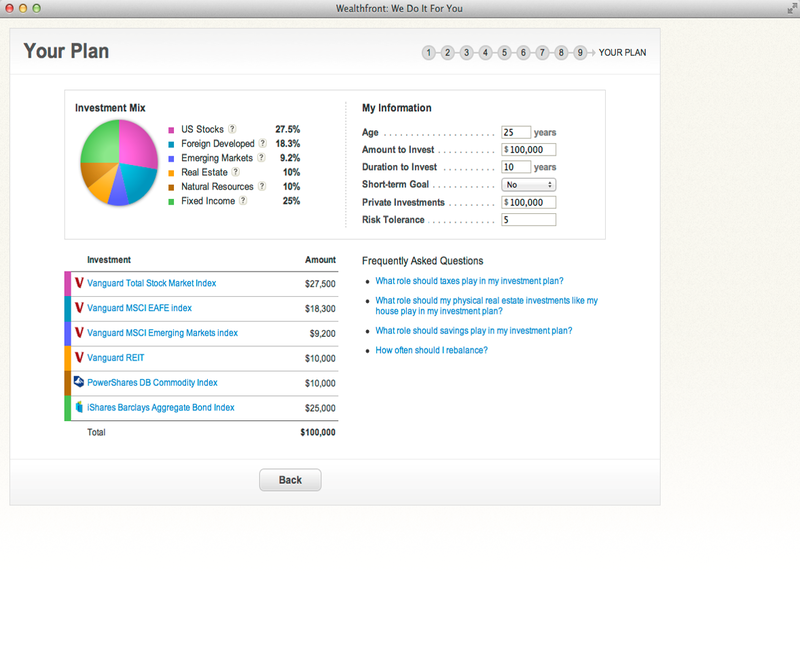 Wealthfront – Wealthfront works by first asking a few basic questions – age, income, liquid assets, risk tolerance. It’s the basics of financial planning. Then it provides a financial plan consisting of ETFs – most of them from Vanguard – that track underlying indices in a variety of asset classes, trades based on what the algorithm instructs… personalize, diversify, re-balance. To date, Wealthfront has raised $130 million, Motif Investing $126 million, Personal Capital $104 million, Betterment $45 million and FutureAdvisor $22 million.